The opposing views of biologists and engineers! The 5th international conference on Biomimetic and Biohybrid Systems was held this year at Our Dynamic Earth in Edinburgh between 19th and 22nd of July 2016. 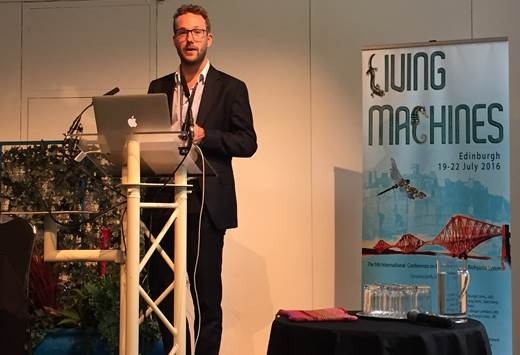 Ruben Kruiper of cohort 2 attended Living Machines 2016 and presented a paper titled: Computer-Aided Biomimetics (link). The paper introduces what is understood by a biomimetics process from a design engineering perspective and proposes several guidelines to partially automate this process. During the talk, one of these guidelines was further elaborated and the concept of ‘function’ in biology was addressed. This subject opened up an interesting discussion that revealed the opposing views of biologists and engineers to this concept, as well as intentionality and sustainability. The 19th was filled with workshops that revolved amongst others around bio-inspired architecture, robots that adapt their morphology to the environment and the societal, economic and ecological impact of biohybrid technologies. The other days of the single-track conference were filled with plenary talks and poster sessions, as well as a diverse range of keynote talks by: Barbara Webb, Thomas Speck, Antonio Bicchi, Frank Hirth and Yoshihiko Nakamura. Pawel Ladosz, one of cohort 1, attended ICUAS 2016 conference in Washington D.C. between 7th and 10th of June 2016. The conference is a yearly event focused on unmanned aerial systems (UASs) and their applications. On first day of conference four tutorials were offered. The tutorials were focused on agriculture applications, UAS design, UAS integration into current airspace and control. Next three days consisted of four keynotes, two panels and many presentation sessions. Keynotes were delivered by representatives from NASA, US army and UAS regulators representatives. The presentation sessions included but are not limited to: UAS design, computer vision, UAS control, path planning and several application sessions. Pawel presented a paper titled: Optimal Positioning of Communication Relay Unmanned Aerial Vehicles in Urban Environments during UAS communication session. The paper showed a method of finding positions of communication relay UASs to improve communication among group of ground nodes, while accounting for effects of obstacles in urban environments. The paper can be found here. Each year, we bring all of our CDT students together to participate in our annual Summer School, which provides an opportunity for all the student cohorts to meet, work together and to learn new skills. At the request of the cohorts, this year the students took part in an ‘embedded intelligence related’ challenge. 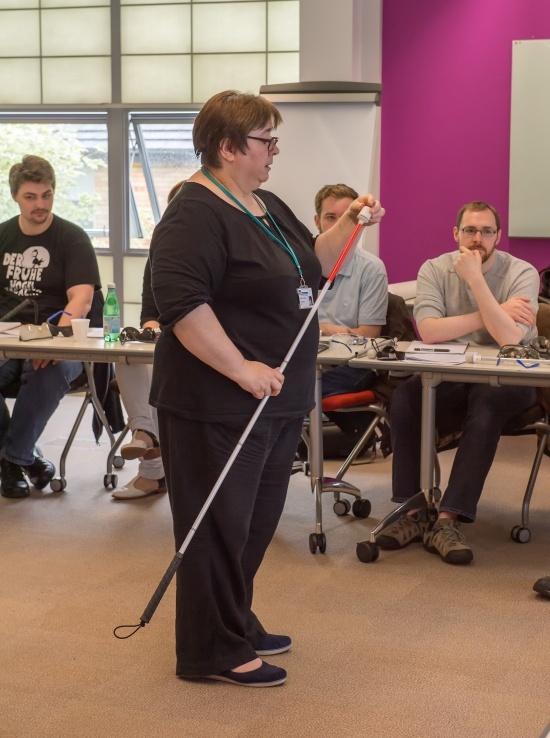 The students were set the task of developing an ‘embedded intelligence’ aid for the visually impaired, in partnership with Royal National Institute for Blind People (RNIB) college Loughborough. The overriding theme of social responsibility and entrepreneurship was apparent in the teams wishing to capitalise on their own research, knowledge and experience to make a real difference in people’s lives. The event was kicked off with a thought-provoking presentation by Anna Janickyj of RNIB College, who introduced the challenges those with visual impairments face daily. The students were able to understand these challenges on a personal level with the use of specialist goggles and tablet apps designed for the able-sighted to see directly through the eyes of the visually impaired. 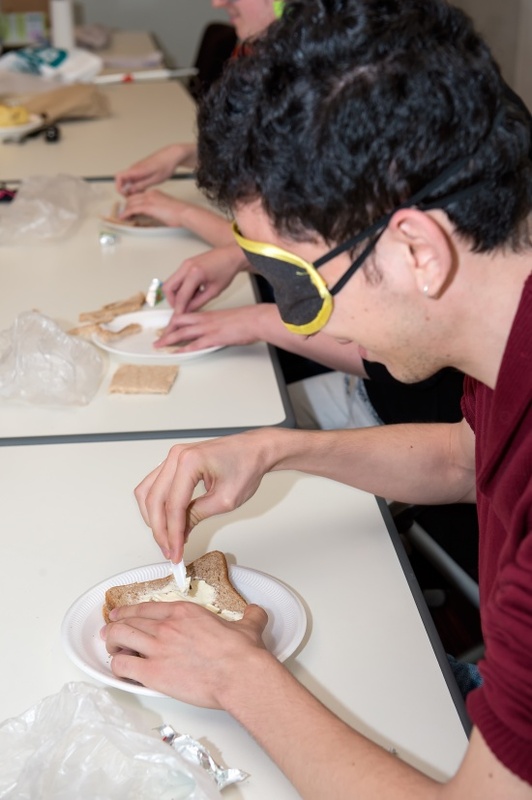 The students then took part in a series of light-hearted challenges involving blindfolds and everyday tasks, such as making a sandwich and peeling a potato, in order to really get a feel of the challenges blind people face on an every-day basis. Much of the next two days were devoted to the three teams brainstorming potential ideas and turning these into physically and commercially viable solutions. 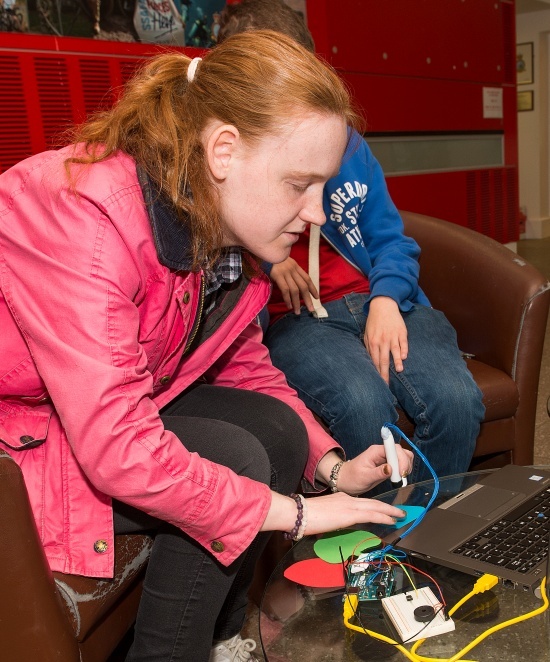 Students could choose from a range of hardware, including sensors, arduinos, magnetometers and current basic models of canes, as well as software available from Wolfson School. Since all students have diverse academic backgrounds, which manifests equally diverse research programmes, this allowed each team to be able to capitalise on a mélange of skills. At the same time, it was an experience which required students to expand their comfort zone, and gave many the opportunity to learn about topics or subjects beyond their conventional realm of study. After a day spent in teams planning and designing prototypes, we welcomed two local organisations to the Summer School, offering fresh thought and inspiration, and the chance for teams to refine their prototypes. George Torrens, Senior Lecturer from Loughborough University’s award winning Design School, presented to the students on ‘Empathy and Sympathy: a User-centred Design approach to New Product Development’. Using examples from his own experience and his background in Assistive Technology, George spoke about the importance of using empathy and affinity to optimise the design process of new products, a ubiquitous theme in this year’s challenge. He identified the challenges associated with Assistive Technology, including social discrimination and the perceptions of disabilities, and suggested ways in which we could overcome these through user-centred product design. Next to present were Martin Grant and Brian Golland from REMAP, a national charitable organisation custom-making equipment to help disabled people lead more independent lives. Supporting the idea that a little sensitive thought could add the most creative solutions, Brian and Martin demonstrated numerous examples of equipment they have adapted, and the positive effects these have had on the lives of the users. In many cases, REMAP take commercially available products and adapt these on an individual basis, often by making the simplest of amendments, allowing gained independence and enjoyment. Find out more about national volunteering opportunities here. On the final day of the Summer School, the three teams presented their final prototypes to a panel, consisting of Prof Martin Goosey, Chair of CDT-EI Advisory Board, Chair of ICT and VP of Technology for EIPC, Lynda Parker, Head of Mobility at RNIB College Loughborough, as well as current RNIB college students Lauren and Kieran. Teams had ten minutes to showcase what they had achieved over the past two days, and since the judging panel included potential users of the prototypes, this meant that one of the most important factors being judge on was the added independence and functionality the prototypes offered to the end user. After great consideration and questioning the prototyping, the panel concluded that the team behind the face recognition app had the most user-centered design and would allow a real gain in independence. 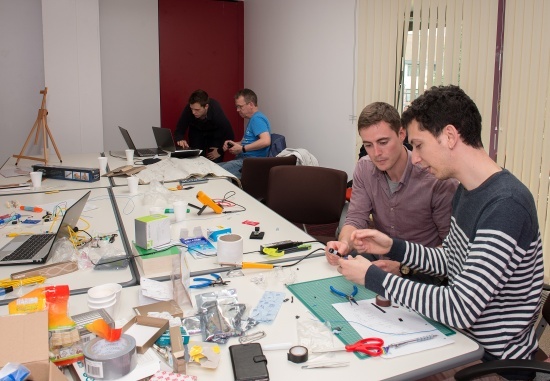 Despite this, all teams were praised for their sensitive approach to the project, with Lauren and Kieran in particular enjoying putting the final prototypes to the test themselves. “For me, Anna from RNIB was the best inspiration for the project. She gave us an insight into the daily difficulties a blind person faces. This was very important, as we take many things we do every day for granted. This was the main source for the design choices we made, within the constraints of the available equipment”, Tobias Reichold from the winning team. 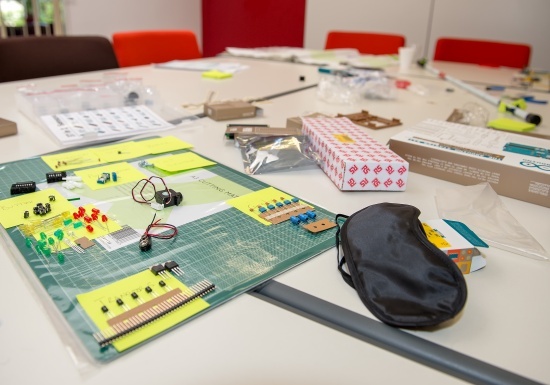 CDT-EI wish to thank all of our Guest Speakers for their participation and inspiration for our annual Summer School, and now aim for the prototypes designed by our students over the course of the event to have future application in the Assistive Technology market. 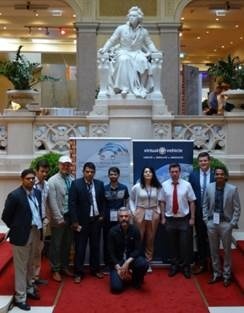 Loughborough University’s CDT-EI participated in the 9th International Styrian Noise, Vibration and Harshness (ISNVH) conference held between 22nd and 24th July 2016 in Graz Austria. The group was also invited to AVL LIST GmBH for a formal meeting and an opportunity to meet their Austrian colleagues. Overall we found this was a fruitful experience. The CDT would like to thank Dr Offner and his colleagues for the both the meal and event. The CDT members who participated in this event were Robert Turnbull and Gajarajan Sivayogan. 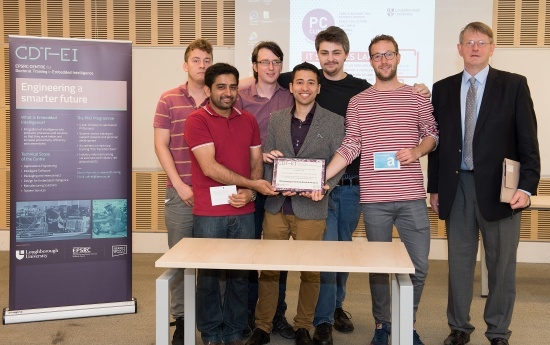 They were also accompanied with members of the Loughborough University Dynamics Research Group, these members included: Professor Stephanos Theodosiadase, Dr Mehdi Mohammadpour, Rickie Bewsher, Ehsan Fatourehchi, Dr Elliot Motato , Ahmed Harris, Vishak Elisaus, , Steve Horner, and Kelly Savva. AVL found the progress done were above board and AVL are looking forward to the further work in the next 3-4 years journey. The dynamics research group contributed two papers to the conference. Firstly Ehsan Fatourehchi presented his paper on ‘Efficiency and Durability Prediction of High Performance Racing Transmissions’. Ahmed Harris and Dr Elliot Motato presented a Paper on the ‘Dampening effects introduced by a nonlinear vibration absorber in automotive drivelines at idle engine speeds’. Both papers received high appreciation and a few questions. The fruitful presentations provided by our colleagues gave us further insight into preparation and delivery of conference papers. Key note speakers provided an insight into industrial research, development and application. A number of fruitful presentations were given by leading industrial experts including our industrial partner/supervisor from AVL. Dr Offner also presented a paper on ‘Current Challenges and Frontiers for the EHD Simulation of Journal Bearings: A Review’. His presentation showed a brief overview of AVL workflow and state of the art literature with regards to simulations in journal bearings. Along with attending the conference the CDT group received an introduction and special training in EXCITE; specifically the group looked into Power Unit module of the program. The introductory training was looking into the analysis of a simplified piston system. Furthermore Robert Turnbull attended a PUMA training course involving the use of the AVL PUMA engine test software. The conference was concluded with some fruitful keynote speakers with the works on Vehicle acoustics particularly interesting. Especially the case of looking into measuring noise in an acoustic chamber and computing numerical models of wind noise. The CDT had a great experience attending the 9th ISNVH conference and the group is looking forward to attending the major milestone at the 10th ISNVH conference. To learn more about agents and Industry 4.0 in practice, I attended the “2nd International Summer School on Intelligent Agents in Automation” (http://www.issiaa2016.ipb.pt/) held at Linköping University (Sweden) from 9-17th of June 2016. An agent is “an autonomous component, that represents physical or logical objects in the system, capable to act in order to achieve its goals, and being able to interact with other agents, when it doesn’t possess knowledge and skills to reach alone its objectives” (Paulo Leitão). The theme of this Summer School was “The 4th Industrial Revolution and the Industrial Internet of Things”, which was aimed at PhD students to discuss intelligent production system based on their cyber-physical formulation. An introduction to the programming language Java and the software framework JADE (Java Agent Development) was followed by the two main courses - Starting and advanced track, the former being the one I attended. Amongst others, we had guest speakers from Festo and SAP as well as the Technical University of Munich and the Austrian Institute of Technology. The talks would vary from industrial agents to model-driven engineering to the Internet of Things; of interest to me were also the introduction to ontologies and the role of human operators in Industry 4.0. Each day would start with a theoretical session and would be followed by practical exercises in the afternoon. On the last two days we worked in teams on the demonstrator shown in the picture below. 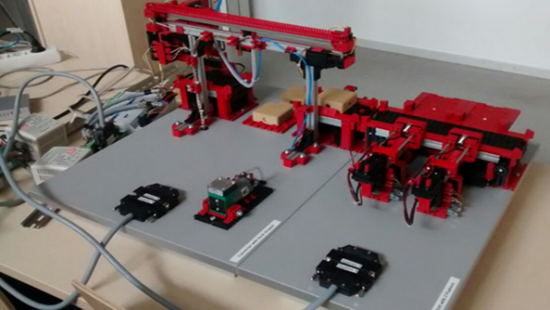 Each team would implement a different part of the model (conveyor belt, gripper, product, etc.) and deploy agents on a PC and Raspberry Pi. Unfortunately, time was a bit short to finish this exercise. The course was a good starting point for an introduction to agents and getting to know the people in this field, but it depends on the schedule next year if I will attend again. 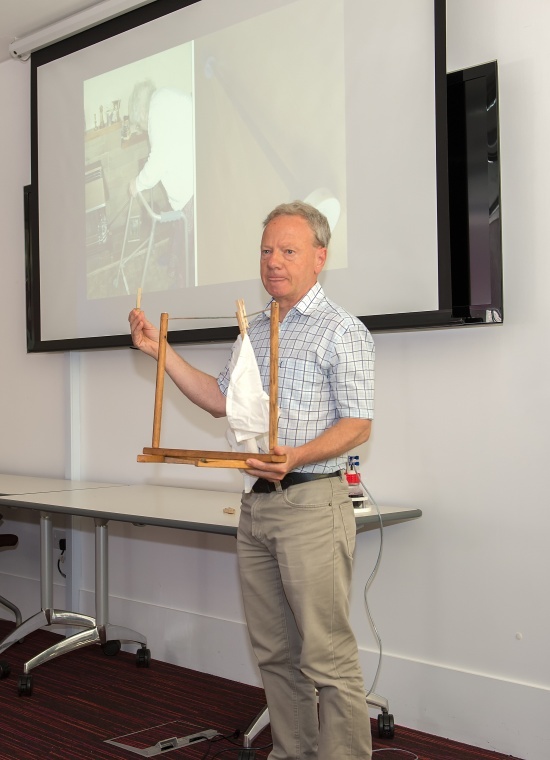 In June we hosted an open afternoon at Loughborough University showcasing the research areas we are interested in and the projects our students are working on. 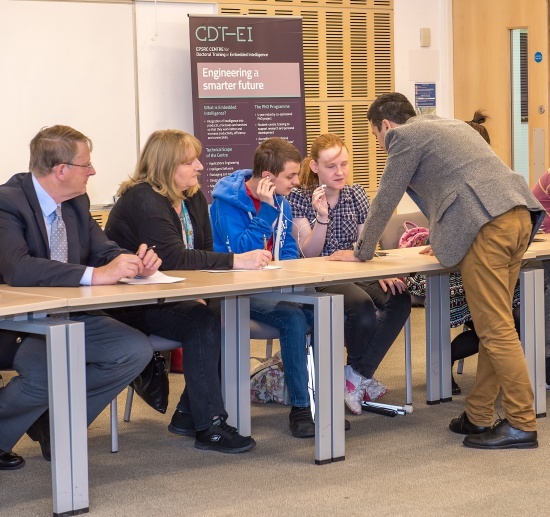 The event was attended by industrial collaborators new and old as well as staff and students from Loughborough University, including the Vice Chancellor!! To up to date about events like this and other news from the Centre please sign up to our newsletter. Our Centre Manger recently presented at the 2016 ARMA annual conference. ARMA are the Associate of Research Managers and Administrators and the annual conference provides delegates with various opportunities to continue their professional development, share best practice and network with colleagues. Sessions covered a wider variety of topics from developing proposals to policy and governance. There were specific sessions dedicated to postgraduate researchers including a special interest group, which Donna attended. 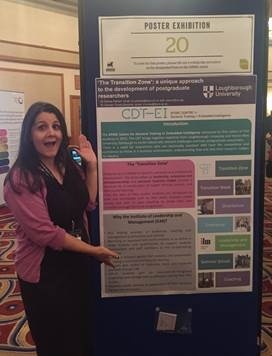 The work presented focussed on our Transition Zone training programme, which is a unique approach to developing our researchers personal and professional skills and is accredited by the Institute of Leadership and Management. The Pint of Science festival is an annual public engagement festival to bring the latest research to the public in an accessible format. Events take part simultaneously across the world in a range of pubs and bars with themes throughout all areas of research. Atoms to Galaxies is the theme that covers physics, chemistry, maths and astronomy. 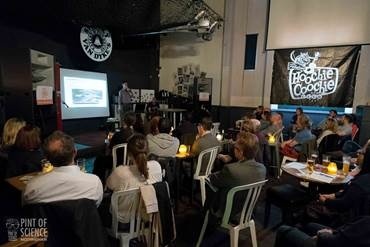 Hosted at Spanky Van Dyke’s, Nottingham, the Atoms to Galaxies team held several events throughout the week. I spoke at the “Making the Future” alongside two other speakers from the University of Nottingham’s School of Physics and Astronomy. The bar was open when I arrived and people were already making themselves comfortable seated around the stage at small tables. There were activities to build molecules from play-dough and sticks while everyone waited for the event to start. The atmosphere was friendly and relaxed, although I was somewhat nervous, as I was the first to speak. Having never delivered a talk to a public audience before, this was a new experience. Producing the presentation had been a challenge to try to give as much interesting information as possible, whilst simultaneously making it accessible to a wide range of people. After a welcome and introduction I was up to give my talk, “Cars on a Diet”. This talk aimed to highlight the reasons why automotive manufactures are trying to reduce the weight of their vehicles, why it is actually quite difficult to do so, and what technologies are currently being implemented. I was handed a microphone, which was also a first, and off I went. The talk was well received and after about 15 minutes the floor was opened up to questions. I had some interesting questions relating to joining of composites and the difference between Formula 1 and road cars, which provoked some interesting discussion. Afterwards I could enjoy the rest of the talks, the interactive activities and the complementary Pints, of Science. I found this a rewarding experience in the preparation and delivery of the presentation for such a varied audience. I had the opportunity to talk with audience members in a little more detail during the break and also enjoyed discussing with other researchers about their interests. Throughout the entire event everyone was engaging and a pleasure to talk to.